Discussion in 'What's Going On' started by alastair, Jan 11, 2019. The information given on the train were that the stops were in relation to icicles in the tunnels and that the train had to stop at each signal box to report their presence or otherwise. 5 min stops were made at Low House Crossing, Kirkby Stephen, Garsdale, & Blea Moor. The train had to stop and report to each box individually. Using the radio system wasn't good enough apparently. All is well that ends well, the train was only 30 seconds late into Euston in the end but stopping that frequently was a little frustrating. Sublime- the loco pairing, the nearly even time run Carnforth to Carlisle and Grayrigg to Shap in 11 min, plus Wilpshire as though it wasn't there. Bizarre - a MN into Carlisle whilst an A4. works out of Victoria, WCML running to time and a special icicle watch for NR. Must agree with your summary here, a very unusual day. Probably not the best day for performance as neither engine was extended, indeed there were a number of comments of how quiet the run up Shap was - even in the third coach we could hardly hear either loco working! However, the weather conditions up in the fells were pure magic, the stuff dreams are made of and something I have always wanted to experience. Many thanks to all the fabulous pictures and videos, some to treasure there. The stop start nature of the run over the S&C gave extra time to appreciate the conditions. And thanks to all who made this trip possible, both locos performed admirably. It was my first ride behind Mayflower - another bonus!! Mick45305, Haighie, green five and 1 other person like this. (hate this word)' stakeholders ' ensures good relationships for the future. Threats of fines will do the future of steam a world of good (not).! The tone of this and previous posts does steam no favours. Matt37401, Victor, GWR4707 and 4 others like this. Good question, I wonder what happened if an icicle had been dislodged by one of the locos and damaged it? Even minor damage wouldn't have been cheap, both locos are fresh out the paintshop! We were down to 30mph through each tunnel. Certainly an unusual one! According to a WCR 'spokesman' there was indeed damage caused to a coach by ice, now whether this happened prior to NR requesting tunnel inspections he didn't say, WCR may have reported it and then, NR requested the action taken. Haighie and acorb like this. +1 Absolutely stunning day, also my first run behind Mayflower, with thanks to all involved, including photographers. Agreed, every operator has a role to fulfil on the big railway including WCRC. Although not mentioned on the train I suspect similar happened with 70013 on The Yorkshireman last March which was the only train over the Harringworth Viaduct that day. I agree that someone needed to look out for icicles, but how do you do that from the cab of a steam loco? No surprises that it's the timers/performance analysts who have taken issue with the icicle checks as it's ruined the southbound run from a timing/performance perspective, though I'd suggest the inclusion of Mayflower would of diminished the potential of the timing aspect too. In reality this trip will take some beating and will possibly be 'The highlight of the year' ! Haighie, andalfi1, 26D_M and 2 others like this. I usually book trips well in advance but I hadn’t booked on this one, however, on last Saturday’s WCME there was a whisper that BIL might be out so I took a punt. Mrs W didn’t have football but declined the offer anyway. We had a couple of inches of snow on Tuesday and a further inch on Thursday, this had partially thawed and then frozen; it was -5C as I made my way to Preston on a clear, calm winter’s morning. Les Ross arrived early and I joined coach F (this would become the 5th when the POB was added at Carnforth). We had a brisk run and soon arrived at Carnforth D&UGL, as we were arriving there was a 47 waiting at the south end, many people feared the worst, a “tail gunner” but were relieved to see that it was at the head of a rake of coaches waiting to depart south. The electric loco was detached and TWO steam locos with a support coach were attached to the front. 61306 (driver Mick Kelly, fireman Chris Holmes) was piloting 35018 (driver Mick Rawling, fireman Frank Chippendale). VT and TP services were running to time so we should be away RT; that is without the hindrance of a late running Northern service to Barrow. So 7L we left and pretty soon it was clear that the pair meant business, you could feel the acceleration and Yealand Bank was dismissed with 44 at the summit. Speed climbed to a max of just under 70 before Beela Viaduct and held well with 67 at Milnthorpe. Speed fell back 63.5 at Hincaster at the top of 2½ miles of 1/173r and as the gradient eases rallied to 66 at Sedgwick. Through Oxenholme (5L) at a creditable 64, even this pair had to yield something to the gradient but by Lambrigg speed remained between 60 and 61. On the final 2 miles of 1/106r speed decayed further and we topped Grayrigg at 57.3 – whew! Now for Shap, there is usually a recovery to refill the boiler and then a (measured) charge to gain some speed to get as far as possible up the bank. This time there was a more measured, confident approach; 2 locos, 2 fireboxes, 2 experienced firemen and 24 driving wheels. We glided up the mile of 1/777r at Low Gill (2L) at 65, but the charge through the Lune gorge didn’t happen. Instead speed built to just over 71 at Tebay S Jn and held well on the 1/146r; still 70 as we re-crossed the Lune, a little less as we passed under the M6 and then onto the 1/75r. We were powering along, 68 across Birbeck Viaduct, 64 under the Greenholme Road, past the gallery in the side road and still 56 as we passed Scout Green. Down to 52 at Shap Wells then onto the summit with a minimum of 48.2 and back up to 51 at the Summit Board (RT). With the help of gravity we were away, the descent was restrained – Mayflower was “new” so brakes were applied as speed reached 72ish. The max was 73.8 near Lowther Viaduct. We shot through Penrith station at a shade over 69 & 4E, a clear run saw us stop in platform 3 at Carlisle 6½E. A start to stop time of 63m 14s for nominally 63.11 miles (my GPS recorder gave the distance travelled as 63.22 miles), either way very close to 60mph average, start to stop with Grayrigg and Shap in the middle and no naughty speeds down the hill. The view from the window had been spectacular; snow, sun and scenery oh and steam – what is not to like and steam heating as well! It was a quick turnaround (1½ hours) but enough time for a walk down to the front where the locos were looking splendid and as I left the station they drew the ECS out to the north. So off to the Woodrow for an enjoyable lunch with andalfi1 and Big Al and I finally got to meet Mr Shireman. Back to the station only 10 minutes before departure and so no time for a wander to the front (now 7½ coaches back). The drivers were the same but the firemen had swapped locos. (63106 Mick Kelly/Frank Chippendale – Rose Grove United and 35018 Mick Rawling/Chris Holmes). A few seconds late and we were off, it was the usual steady start but beyond Petterill Bridge the power was applied and 2 miles out as we crossed under the M6 we were close to 31 (single loco is typically 26/8). We accelerated up to 39 on the 1/132r to Cumwhinton and on the level reached a shade under 50 at Howe & Co SB (still ½L) speed held well on the 1/132r beyond with 48+ across Cotehill Viaduct. Then approaching Low House Xng SB we slowed and stopped, we were held for 5 mins; there were no Northern services, a preceding freight was over an hour earlier – trespass, infrastructure issue? We were 7½L. We ran only steadily to Armathwaite (35 & 8L) with a max of 38 beyond, then we slowed right down to 20 for Armathwaite and Barons Wood Tunnels (a clearance issue seemed unlikely, possibly weather related?). Once clear we took advantage of the falling gradient and reached 60 in the dip before Lazonby with 58 through the station (11L). This was followed by just under 60 across Long Meg Viaduct and 58 on the 1/164r through Little Salkeld and a fraction higher through Langwathby – this was more like it! By Culgaith SB we had clawed a minute back (10L) and a little more back to us as we passed Kirkby Thore at 61. By Long Marton we were down to 8L but then we were stopped at Appleby SB, only for 30 secs but by the time we stopped in the platform we were 10L. Despite being egged on by andalfi1 I decided against an ice cream; others were braver/more foolhardy. We had a booked 16 min stop although this was reduced to under 14 during which I understand the B1 took water. We left a little under 8L. As with the run through the Lune Gorge; there was no harem scarem start; we crossed Ormside Viaduct at just under 54 with a max of almost 55 just beyond, past Ormside station at 53 & under 6L. Then we slowed and passed through Helm Tunnel at 30, once clear we accelerated up the 1/100r and with the easing of the gradients passed Crosby Garrett at 48 & 7½L. Despite the stops and speed restrictions we were doing ok. Approaching Kirkby Stephen we were held again (over 2 mins) we passed KS 14L and set to work on the 1/100r we reached just under 38 before slowing to 30 for Birkett Tunnel once clear the locos set about what remained of the climb. On the easier gradient (1/330r) speed reached 46 at Mallerstang (14L) and continued to increase with a whisker under 50 at Angerholme, the valley was in shadow but the tops of the snow covered hills were bathed in late afternoon sunshine but not much time to look. We briefly touched 50 just beyond Angerholme but even this pair had to yield a fraction to the climb with 49½ under the road bridge with a minimum of 48.3 beyond and back up to 49½ as I passed the Ais Gill Summit Board. Now downhill but we were stopped again at Garsdale (4 mins) now 20L. Slow through Rise Hill Tunnel and Dent up to 54 as we curved around the hillside then slow through Blea Moor Tunnel and stopped again at Blea Moor SB (3½ mins) – now 30L. It was around this time that Les (Train Manager) announced that NR had asked us to check on icicle formation in the tunnels and report back to the signalmen in preparation for Northern services resuming on Sunday. Apart from a slowing through Stainforth Tunnel that was the end of the unscheduled stops. There followed a fast run down the hill; Horton in R (61 & 28½L), Helwith Bridge (61 & 28L), Settle (62½ & 25L) and Settle Jn SB (60 & 24L). We stopped in Hellifield loop just over 23L. Time for a snack, last week it was Christmas cake and this week a hot cross bun with cheese – how quickly the seasons change! We had a booked water stop of 17 mins when presumably 35018 would take water. It was 19 mins later when we set off (25L), the light had gone. Some quick running saw us reduce the deficit to 15L as we passed through Clitheroe at 50 and further reduce it to 12L through Whalley at a shade over 49 and onto Wilpshire Bank (1/81½r). Speed fell away to a minimum of 46.2 as we passed behind Billington then the locos fought back with 47.2 through Langho and increased further to 47.8 where the gradient eases to 1/88r but as the train entered the tunnel (1/68r) speed fell back ever so slightly to 47 with 43.5 through Ramsgreave and Wilpshire with a minimum of 42.7 to the summit. Wilpshire bank had been destroyed. I made it 5m 44s for the 4.5 miles between Whalley and Ramsgreave & Wilpshire stations, an average of 47.1 mph. On through Blackburn and now only 4L, but then an announcement that the water supply at Hellifield had been frozen and we would be making an impromptu water stop at Cherry Tree. I don’t know how the water was delivered, it may have been from a road tanker but WCRC have previously used the hydrant just at the top of the ramp to the Preston bound platform. After 5 mins we drew forward and watering took a further 30 mins. We started the final leg 42L. Still 42L through Pleasington at 40 and then we topped the 1/110r at Hoghton at 50. On the falling gradients the locos were doing their best to make up time with a max of 69.7 just after Hospital Xng. Through Bamber Bridge (40L), Lostock Hall (39L) before joining the WCML at Farington Curve Jn. We had the usual check just south of Preston before we could cross over to platform 6 and stop 33L. 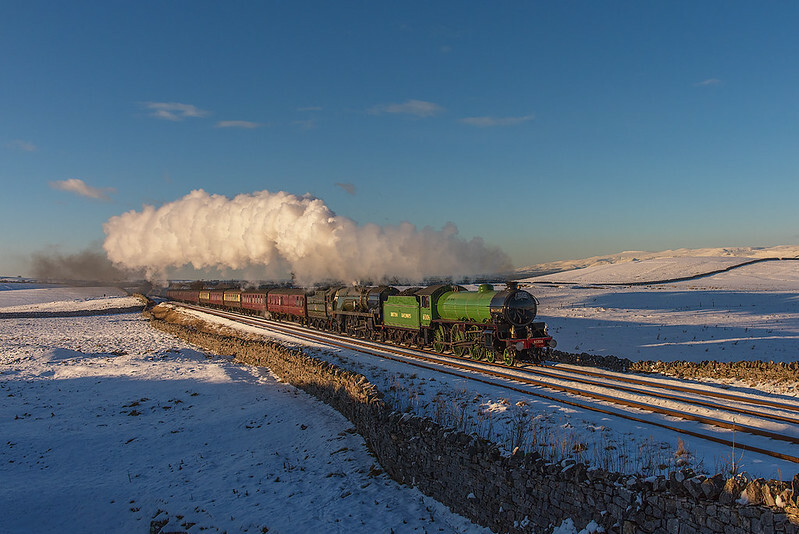 A walk to the front to see the locos and support detached and head north to Carnforth – very atmospheric. As we left the station Les Ross was already hooked on the south end. I was home for just after 19.30, Mrs W was not happy her team had managed to turn a two nil lead into a five two loss. Well what can I say, a memorable trip; a terrific climb over Shap, some great work on the top part of the climb to Ais Gill and the demolition of Wilpshire Bank and all on a splendid winter’s day. 61306 behaved admirably (as far as I know), my first trip behind her and my first real trip behind BIL. I look forward to more. My thanks to everyone who made all of this possible and so enjoyable and on a day with many operational challenges. I shared a table with Bullied Pacific who is an entertaining travelling companion. I hope that Victor had a good day and I hope that main line steam can produce a day like this when I’m 80 (not for a good few years yet). One downside, although convenient for NR to have us inspect, stop and report it was not convenient for passengers on the train who were delayed and may have had ongoing travel issues. However, swings and roundabouts, we did stop and water at Cherry Tree. My old PC is back with a new hard disc (yes I had backed up the old one) and Windows 7 (as before) but now the web app Javawa (gps track analysis) won’t analyse. Could anyone who might know how to fix this please PM me – thanks. GWR4707, gricerdon, keith6233 and 16 others like this. Great report @Oswald T Wistle . Was there a preceding freight? According to RTT, this was the only train on the line yesterday, so the first southbound since 2100 on Friday. As you say, swings and roundabouts, wish I'd been on it. I can just imagine the Howgills as you come round the corner at Low Gill, and the scene from Birkett and Ribblehead looks tremendous. I presume the steam heating worked! Steam Heating was very intermittent in Standard Class, even with the 86 on the front. But it wasn't really that cold inside. More than comfortable in shirtsleeves. Can never figure our why so many folk sit in the carriages wearing their outdoor jackets. CLN_WVR, D1059, Johnb and 26 others like this. Unbelievable!!! For someone who wants to see steam on the mainline, a little cooperation with NR and other (hate this word)' stakeholders ' ensures good relationships for the future. Threats of fines will do the future of steam a world of good (not).! The tone of this and previous posts does steam no favours. If you think about it, it was perhaps convenient for the West Coast crew to do the job for Network Rail. However, if there really was a concern then why on earth didn't NR send something along the route in the morning before the charter to ensure that the route was safe for the train to use it. Ask yourself whether sending several hundred people through tunnels in a train where something pointed might be dislodged is a good idea, And the lead loco doesn't offer much protection for the crew either. One of the WC crew who I spoke to had a pretty dim view of the request - co-operation or no co-operation. acorb, Bluenosejohn, 26D_M and 2 others like this. No, yes and yes. I checked earlier in the day and 669Q was not showing cancelled, I meant to re-check but forgot. As you say the view at Low Gill was spectacular possibly as good as it gets. In coach F the steam heat wasn’t working until after Shap summit but it was ok with the sun through the windows and the coach had been prewarmed with the ETH. It was working throughout the southbound run. NR must have a duty of care to ensure that the line is safe prior to allowing traffic to use it especially with something like icicles and there were some whoppers hanging from the side arches of overbridges. Rather than send an inspection train through I fear they may have closed it pending inspection. andalfi1 and 26D_M like this. Johnb, Shep Woolley, gricerdon and 29 others like this.